When you get reputation, you get a +X green spot on your reputation feed telling you that you gained reputation and if you drop down the menu, you get more detail. How about we make it that when you lose more than you got since the last time you checked, you see it red with a little -X. For example, let's say you've just looked at the reputation bar so any old rep notification is gone and you ask a new question. 3 users downvote your question and 1 upvotes it. You will see it green because you gained 5 rep but you should see it red because you are at -1 rep. This would help people improve their questions / answer by seeing, as soon as they get on the site, that they got negative feedback and that something needs to be checked / changed. We want to let you know about good things as soon as they happen - that's what our real-time notifications are for. Negative reputation changes are... well... negative. So we are not in a hurry to let you know about them. I strongly disagree, and all the comments and upvotes there and here appear to as well. I would much rather see notification of downvotes than upvotes. I get it - the drop-down is called achievements. But reputation losses do show up inside the "achievements" drop-down, so it wouldn't be unprecedented to highlight them where we can see them without having to click. An upvote is (should be) the status quo. It's a little pat on the back. A downvote means something's wrong. Maybe I wasn't clear in my post. Or maybe I misread the question. Often, this should be an action item. Unless someone comments (which we all know isn't mandatory), I may leave an innocent questioner out in the cold, or otherwise miss an opportunity to help. Is the purpose of the achievements display to stoke egos, or to make the site better? If this feature request would be a major shift in the definition of "achievements", then so be it. A response of "things are the way they are because that's how they are" isn't a compelling reason not to change it. If, and this is a huge if, the fear is that new users will be crestfallen to see notification of downvotes, then enable this only for users with the "Established User", "Vote Down", or "View Close Votes" privilege or something. But I again feel this is valuable and pertinent information for everybody, regardless of what sentiment it brings. Besides, brand new users only start with 1 rep to begin with, can't lose rep, and as such won't see this display. I answered a fairly standard question here. Nothing to write home about. There were no other answers, I don't have experience with the framework OP was asking about, but I knew what the error meant, so explained what was happening. OP asked for some clarification, I responded to the best of my ability, and walked away. Presumably my explanation wasn't sufficient, so my answer was voted down. I didn't notice this for five hours. On finally realizing my answer didn't yet help him, I did a couple minutes of research, found the solution, and edited my answer. That was exactly what he needed, and the downvote was converted to an upvote. If I'd seen a notification of the downvote, I could have helped him earlier. At the end of the day, that's what this is all about. Questions get a mix of upvotes and downvotes all the time. But when an answer gets a downvote, it can often be improved, and will be improved sooner with this display. The second highest voted status-declinedfeature-request of all time, shows clearly the possibility that downvotes prompt users to improve their posts. It means a bit over 20% of downvoted posts got improved, explained in comments or was found not that bad after they got downvoted. More specifically, there are 148979 posts that got downvoted, edited and upvoted, in that order. This gives almost 7% of all downvoted posts. There are 168593 posts that was downvoted, then edited, and now have a positive score. Or 292718 with non-negative score (positive or 0). This gives almost 8%, or near to 14% of posts that (probably) was bad but now are not so. There are 94875 posts that was downvoted -> commented -> edited -> updated. But in order: 778279 posts was commented after downvote. 318912 of them was edited after that comment. This means, to the best I can guess, that on over 40% of posts that generated notification after downvote an attempt to make them better happened. On 12% of downvoted->commented ~= 30% of downvoted -> commented -> edited it succeeded, at least partially, giving follow-up upvote. Now, it is a matter of interpretation if 7% or 20% means something, but for me it is a strong sign that downvoted posts really gets improved, in non-negligible amounts. Based on Molot's excellent queries I took a stab at looking at the potential benefit of this change. There were 75.2k downvoted posts in 2014. Of those 75.2k, 19.7k (26.2%) were edited by the owner after the downvote. Of the 19.7k posts that were edited by the owner, only 2,097 (10.6%) were upvoted after the edit. Of the 75.2k posts, 55.2k received comments, 20.0k didn't. Of the 55.2k that received comments, 15.1k (27.2%) were edited. Of the 20.0k that didn't receive comments, 4.6k (23.0%) were edited. Of the 15.1k posts which received comments and were edited by the owner, 1.5k (9.9%) received upvotes after the edit. Of the 4.6k which didn't receive comments and were edited by the owner, 602 (13.1%) received upvotes after the edit. People learning about downvotes seems to increase the probability they will try to do something about it, but decrease the probability that it actually works. This pattern holds for other time periods as well (I checked some dates in 2013 as well, similar pattern). My assumption is that people who care about quality will edit their posts regardless of if they get a distinct notification or not. There isn't much sense in bringing people's attention to the problem if we can't become more successful at teaching them how to improve it. We are definitely commenting on posts with downvotes at a good clip, but we aren't turning those comments in to successful edits better than people who take it in to their own hands to edit after a downvote in the first place. 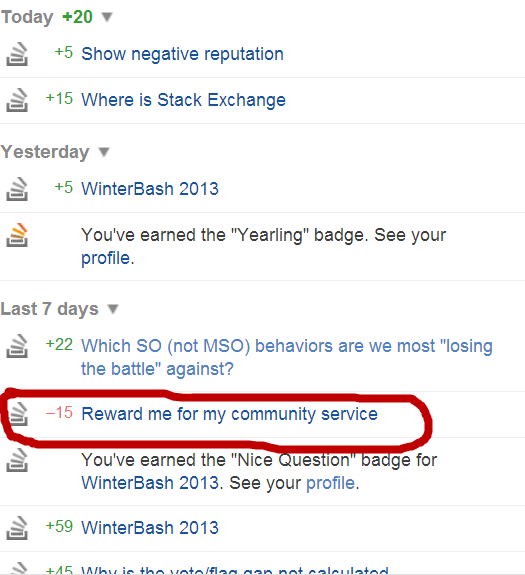 Adding a notification of negative reputation doesn't look like it will solve the problem. What benefit does this provide? There isn't anything you can do about downvotes. Sometimes they just happen. Making it more visible when it happens is only going to increase discontent, without increasing the quality of content. We already get loads of complaints on meta about 'undeserved' downvotes. This is not limited to low-rep users. If people start getting real-time updates every time they get downvoted, it will only compound the problem. I don't really have anything new to add here but am posting an answer since I'm formally declining this; jmac and Shog cover all the reasoning against doing this pretty well. It's just too hard to see the number of people motivated to improve their posts outweighing the number of people who will be upset by every downvote or want to start an argument about each one. And how exactly does this help them improve their work? Sufficiently self-critical folks presumably already know when they post something half-assed; they don't need the reminder. Insufficiently critical authors are probably not going to have an epiphany in response to seeing "-2" pop up. I think it's only fair to show these rep changes in the dropdown itself - folks don't like seeing weird inconsistencies in their reputation - but there's no particular need to rub folks' faces in it. Wanna help someone improve their work? Leave a constructive comment. They'll get a top bar notification for that already, and almost certainly have an easier time figuring out what to do in response to it. I agree with jmac - this stands a much better chance of increasing pointless whining than it does improving the quality of posts. That said, if you personally know how to respond constructively to downvotes and are obsessive enough to want to do so as quickly as possible after they come in... There is a work-around: just get upvotes on a regular basis, such that when you get a downvote you see a +8 / +3 rather than +10 / +5. Not the answer you're looking for? Browse other questions tagged feature-request status-declined reputation notifications top-bar . Why aren't there notifications about negative reputation changes? Why don't negative rep changes show in the topbar? When did the rep notification for downvotes disappear?